Blythewood by Carol Goodman is the story of a young woman named Avaline Hall in early 20th century New York, who begins by working as a seamstress in a hat factory, an orphaned girl who never knew her father, and whose beloved mother recently passed away. She is quickly caught up in adventure as a strange raven-haired boy appears in her workshop and tries to protect her from a suspicious looking man in an Inverness cape, when suddenly s fire breaks out that threatens to burn the entire hazardous building with all its occupants. Luckily the mysterious boy appears again and saves her and several other girls, just as the evil man disappears into a flock of ravens and the boy appears to fall to his death. Avaline wakes up in a mental hospital, wondering if she hallucinated the entire event, when she is finally rescued by her unknown wealthy grandmother’s secretary. Next, Avaline is enrolled at an elite all-girl’s academy that trains young women in more than just academics, and soon discovers what it means to be a chime child and the deeper power of the bells that ring in the school’s belfry and in her own head since childhood to warn of danger and unexpected aid. For anyone fascinated by magic or creatures of magic, this coming of age tale will get you hooked on a brand new fantasy series as you learn along with Avaline about the Order of the Bells and the untapped power of the human mind. If you liked the aspect of the school, and different teachers’ personalities, Avaline’s advocacy for the better treatment of fairies, read The Goblet of Fire by J.K. Rowling. If you liked the fairy creatures mentioned in this story, and are curious to hear more tales of them, kelpies and other magical creatures are mentioned Wonders of the Invisible World by Patricia McKillip. If you liked the haunted mysterious aspects of the story, and were enraged and fascinated by Avaline’s time in the Bellevue Pavilion for the Insane, look up Asylum by Madeleine Roux. If you liked this author, look up some of her other books like her similar fantasy series under the pen name Juliet Dark which begins with The Demon Lover. Or you could try her regular fiction with a similar setting, like her latest novel, Arcadia Falls, that also includes a story of a changeling. Or you could try one of her other books that echoes the story of Tam Lin and other fairy tales, The Seduction of Water. John Keat’s “Ode to a Nightingale” and Alfred Tennyson’s “Lady of Shallot” are excellent poems also mentioned in this story that deserve reading. I chose this recipe because Avaline and Raven share a meal of rolls stuffed with cheese with a side of apples underneath his tree home. Baked apples and savory pies were also mentioned as being served for dinner at Blythewood, and there is an apple orchard located behind the school. I chose the addition of bacon to make this a more savory and delicious snack. 1. Preheat oven to 400 f. prepare a mini-muffin pan by spraying with a nonstick cooking spray. 2. Cut each sheet of puff pastry into thirds, then each third into fourths (you’ll have 12 squares per sheet). 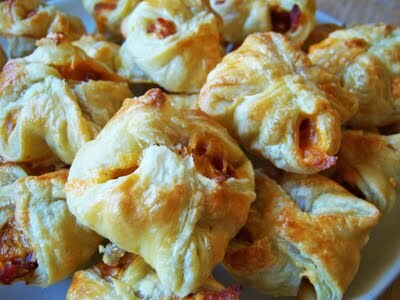 Place a square of puff pastry in each mini-muffin cup & press to fit, leaving the sides to fold over later. 3. Fill each square with a pinch of cheese, a couple of pieces of diced apple, bacon, & a bit more cheese. Fold the corners of each square up to the center & press together to seal shut. Brush the tops with a bit of egg wash.
4. Bake for 15 minutes or until golden brown, rotating halfway through. 3. What did you think of the descriptions of the college Blythewood? Did it fit your predisposed imaginings of a 20th century women’s college, with tea dresses, straw boaters, tea gardens, and studying in a cool room lined with books? 4. On pg 18, the author compared fire to rats and a phoenix (firebird), what animal or item would you say a blazing fire looks like? 5. Avaline was told she was no more mad than anyone would be after being locked up for 5 months in Bellevue Pavilion for the Insane. Do you think sometimes mental hospitals, through use of dangerous treatments, created more problems than they solved in patients? 6. “Fashionable people flee the city during the hot summer months.” (37) Where would you go, or would you stay, if you lived in a hot climate? 7. Have you ever tried to open up a shy person with a kind word or compliment? How did it work out? If you haven’t yet, try it sometime and tell what happened. 8. Has music or the sound of bells ringing out a song ever made you feel “part of something bigger’n yourself” or “like you’re a part of the sound”? If so, where and when did it happen? Was it one song or a concert? Live, on a cd, or on the radio? 10. If you were chosen as a member of Blyewood, as all students have a certain “inherent power,” what do you think yours would be, based on your current strengths? Also think about the four elemental magics (earth, fire, water, and air), and which is your preferred favorite to use and why. 11. Do you know what time of day you were born? If not, find out, and think about how that could make you magic stronger if you had attended Blythewood. 13. What did you think about the mention of secret fairy journals of Charlotte Bronte? Does she seem like an author who would write such a thing? Are there any other classic authors you can think of that might have written about secret encounters with fairies and other fey creatures? 14. Were you frustrated by any of the loose ends left in the story, even those from the beginning? (Dr. Pritchard forcing madness, Avaline never finishing her vows) How did these set the book up for a sequel? 15. What similarities can you draw between this book and the works of J.K. Rowling? Do you think she may have influenced this author?